Jack Teagarden was a trombone player, singer, and band leader whose career spanned from the 1920’s territory and New York jazz scenes to shortly before his death in 1964. Teagarden was not a successful band leader, which may explain why he is not as widely known as some other jazz trombonists, but his unusual singing style influenced several other important jazz singers, and he is widely regarded as the one of the greatest, and possibly the greatest, trombonist in the history of jazz. Teagarden was born in 1905 in Vernon, Texas. Born Weldon Lee Teagarden or Weldon John Teagarden (more sources say Weldon Lee, but John makes more sense considering his nickname), Jack’s earliest performances were working with his mother Helen, who played ragtime piano, in theaters. His siblings also became professional musicians: his younger sister Norma played piano, his younger brother Charlie, trumpet, and his brother Clois (“Cub”), drums. Jack Teagarden began playing piano at age five, took up baritone at age seven or eight, and had settled on trombone by age ten. Some sources claim his unusual style of trombone playing stemmed from the fact that he began playing before he was big enough to play in the farther positions. He moved to Chappell, Nebraska, with his family in 1918, but by 1921 was back in Texas playing with Peck Kelley’s Bad Boys. Through the early and mid 1920’s, he played with several other territory bands, including Doc Ross’s Jazz Bandits, and the Orginal Southern Trumpeters. My sources disagree concerning which band brought Teagarden to New York, and with whom he made his earliest recording, but there is agreement that he arrived in New York in 1927 and was playing with Ben Pollack’s orchestra by 1928. His unusual approach to trombone playing had both a technical and a stylistic component. His technical approach in particular was quite unorthodox. A short digression into the mechanics of trombone playing will explain why. The trombone slide has seven positions where traditionally notated (chromatic scale) pitches can be played. Each position causes the instrument to be a slightly different length, and the instrument can play a (different) harmonic series at each length. The notes in any harmonic series are much closer together in the upper part of the series. This has a practical effect on trombone playing: in the lower register of the instrument, there are fewer notes in any given position, and often only one position in which a note can be played. In the upper register, notes in any position are closer together, and many notes can be played in more than one position. New Orleans-style trombonists tended to play in the lower range of the instrument, where it is simply impossible to change notes as quickly as a trumpet or clarinet does; entire arms can’t move as fast as a single finger. So the traditional trombone stylists specialized in playing simpler accompaniment parts featuring cute special effects like glissandos. Jack Teagarden apparently did not like this “tailgate” style of trombone-playing. Instead, he played higher in the instrument’s range, using mostly the first and second positions, and rarely moving beyond fourth position. Teagarden’s style is also often described using words such as lyrical, vocal, legato, relaxed, fluent and smooth. The two premier trombonists on the New York scene when Teagarden arrived had also already rejected “tailgate” style playing, and there is disagreement about how much Miff Mole and Jimmy Harrison influenced Teagarden. But Teagarden appears to have arrived in New York with a clear idea of how he wanted to sound, and although the three players do seem to have influenced each other somewhat, they each also retained their distinctive styles. Harrison also played in the upper register of the instrument, so that he could play fast trumpet-style licks, but his playing is still firmly in the jazz brass tradition, with hard, clear articulations. Mole also specialized in technically spectacular playing, with staccato phrasing, big leaps, and surprising note choices. Teagarden’s gently-articulated style gives the trombone a lyrical, almost vocal quality (without having the extremely “sweet” ballad-type sound that, for example, Tommy Dorsey made famous) and has in fact been compared to his own (Teagarden’s) singing style. And although his playing style was also technically brilliant, featuring difficult techniques such as lip trills, his laid-back, vocal style of delivery  often described even as a “lazy” sound  effectively disguised his technical proficiency (“lazy and lightning-quick”(. One source reports that Tommy Dorsey specialized in sweet ballads specifically because he felt his jazz was “inferior next to Jack Teagarden” and that Glenn Miller “de-emphasized his own trombone playing” after a stint playing beside Teagarden in Pollack’s orchestra. This may be overstatement, but it does underscore a fact that all sources seem to agree on; like his trombone style, his singing style seems to have been both uniquely his own and authentic bluesy jazz. Both were deeply affected by a knowledge of and ease with the blues that was available to few white players of the time. The Texas town in which Teagarden grew up had a large black population, and he must have heard spirituals, work songs, and blues from a very early age; in fact, revivals were commonly held within earshot of his home. It was this background that was probably the greatest influence on all of Teagarden’s work, both vocal and instrumental, and his use of the blues idiom was so convincing that Fletcher Henderson apparently suspected that Teagarden was “colored”. As mentioned above, by the summer of 1928, Teagarden was playing with Ben Pollack’s orchestra, and he stayed with Pollack, performing and recording, for nearly five years. During this period, he was involved in a large number of recordings, with Pollack’s orchestra, with other groups, and leading his own sessions. Teagarden particularly made some noteworthy contributions while working at this time with Eddie Condon. Teagarden was one of the musicians on the first interracial recording session, organized by Condon. Teagarden’s first vocal recording was made with Condon, and also the first recording featuring his use of a water glass as a mute. Teagarden had a mechanical bent and a life-long interest in tinkering with things, and he invented the water glass mute effect, in which the bell section of the trombone is removed and an empty water glass placed over the end of the instrument tubing (of the mouthpiece section). The effect is a stifled, plaintive sound which makes the instrument sound even more like a blues singer. Another interesting aspect of the recordings of this period is that they show very clearly that, unlikely many other jazz musicians of the time, Teagarden was a true improviser, giving notably different solos on different takes of the same piece  even when the recordings were made on the same day. Teagarden left Pollack in 1933, and signed a five-year contract with Paul Whiteman’s orchestra. It was a steady, well-paying job, for which Teagarden was apparently grateful; he seems to have been perpetually unlucky with both women and money, and had already experienced some personal financial problems. But the Whiteman group was not particularly musically inspired. The Teagarden brothers (Jack and trumpeter Charlie) are generally considered the only interesting jazzmen to have been part of it, and yet Jack also felt a little out of the limelight. He did some playing and recording with other groups at this time, most notably with his brother Charlie and saxophonist Frankie Trumbauer as the “Three T’s”. But Whiteman’s group kept him a little too busy doing highly- arranged popular music, and he left when his contract was up. This was the period when everybody who was anybody in jazz had their own band, so Jack Teagarden decided to organize his first band in 1939. Unfortunately, he had neither the dominant personality nor the business smarts to be a good bandleader, and by the end of that year he was already $46,000 in debt. Refusing to give up, he started a second band in early 1940, and this one he managed to keep going until late 1946, in spite of losing far too many good musicians to the draft. Unfortunately, this band also cannot really be considered a success. Desperate to keep afloat, the group played too many gigs at which they were expected to have a sweet, popular sound. Cut off from the developing edge of jazz, it had no real influence and produced few recordings of note. Hit hard by both the war and the competition from bebop, several of the more famous big bands called it quits in 1946, and so did Teagarden. He headed back to New York, and by 1947 was playing with Louis Armstrong’s All Stars, a smaller group that is considered to have been a leader in the anti- bebop traditional jazz “revival” movement. The All Stars did well, but Teagarden left in 1951, in order to once again put together his own band. This All Stars group, a sextet along the same lines as Armstrong’s All Stars, with various musicians including at times Earl Hines, Teagarden’s brother Charlie on trumpet and his sister Norma on piano, was also a success, touring both Europe and Asia and playing traditional jazz in a way that made it sound fresh and creative. Armstrong apparently considered Teagarden a friend, not a rival, and they continued to work together from time to time. Known affectionately as “Mr. T”, “Big T” (to brother Charlie’s “Little T”), “Jackson”, “Gate”, and “Big Gate” (again, Charlie was “Little Gate”), Jack Teagarden was by all accounts a big, easy- going, friendly man, well-liked throughout his career by his fellow musicians. At this point, he was also the grand old man of the instrument, well-respected both by traditionalists and (unlike many other traditionalist players) also by the more modern generation of trombonists. The “reunion” at the Monterey Jazz Festival, with his brother Charlie, sister Norma, and even his mother, who played a few ragtime piano solos, is considered to be a celebration of the life of a great jazz musician. He died only a few months later of pneumonia, at the age of fifty eight, in New Orleans. 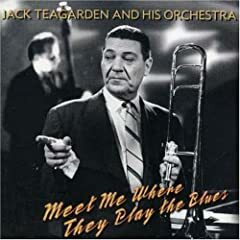 Jack Teagarden’s most important recordings include the recording with Benny Goodman of “Basin Street Blues”, with Teagarden on both trombone and vocals, which included extra lyrics written by himself and Glenn Miller that later became a standard (and usually unattributed) part of the song lyrics. Teagarden’s recorded work as a trombone soloist is considered very consistently high quality, but the following are often mentioned in particular: “Knockin’ a Jug” (1929, with Louis Armstrong), “She’s a Great, Great Girl” (with Roger Wolfe Kahn), “Makin’ Friends” and “That’s a Serious Thing” (1928, with Eddie Condon), “The Sheik of Araby” (1930, with Red Nichols), “Beale Street Blues” (1931, with Joe Venuti and Eddie Lang), “Jack Hits the Road (1940, with Bud Freeman), and “St. James Infirmary” (1947, with Louis Armstrong). His recordings of “I Gotta Right to Sing the Blues”, “Texas Tea Party”, “A Hundred Years from Today”(all 1933), “Stars Fell on Alabama”(1934), “I Hope Gabriel Likes My Music” (1936), and “Nobody Knows the Trouble I’ve Seen” may be considered his best vocal offerings. “I Gotta Right to Sing the Blues” in particular became a signature piece for him. Since much of Teagarden’s best work was as a sideman rather than a leader, many of his best recordings are included in collections of other artists’ work. All About Jazz musician pages are maintained by musicians, publicists and trusted members like you. Interested? Tell us why you would like to improve the Jack Teagarden musician page.